It’s little wonder that many new car buyers are making the change over to a new Volvo, especially when you realise just how nice the drive is. The new Volvo V90 is a very modern and luxurious vehicle offering an amazing level of high-tech equipment in a user-friendly package. The car’s style is first class, while the engines provide satisfying performance. A new Volvo V90 Diesel estate is a highly desirable drive, and one that rides really nicely. Looking over the bodywork of the 2017 V90, the flowing lines are defined with bold and conclusive detailing that creates a look that’s very modern and attractive. Distinctive styling of new Volvo V90s draws the eye and sets the standard for modern car design, ensuring that the design is every bit as good as a Mercedes Benz, Lexus, Jaguar and BMW alternative. Headlight shape, daytime running light design, numerous alloy patterns, tailgate profile, and overall poise and balance has serious attention-grabbing ability. You’ll enjoy owning the nice looking new V90 Diesel wagon for its magnificent looks alone. Head inside the new V90 cabin, and the high level of comfort and style makes an immediate impression. Sensual materials, style, comfort and features all point to the V90 being a fully kitted luxury wagon. High marks for interior design put the new V90 wagon at the top of the class again. Though fully equipped with every high-end technology, the Volvo V90 wagon is designed to make using the modern technology simple and easy. Volvo’s dash design looks so good because it’s uncluttered and easy on the eye. Leather upholstery and materials inside the car are exquisite, while the space for seating five large adults in comfort in the first and second rows is excellent. At this stage just the new XC90 will offer seven seats. Electronically heated and memory front seats are standard, and the ease with which one can get comfortably seated behind the wheel in the driver’s seat is excellent. There are many wonderful features inside the new V90. 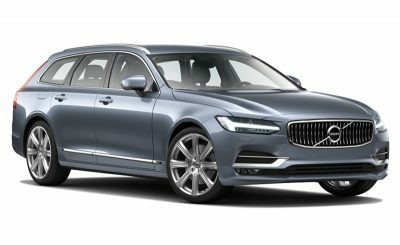 Skype connectivity is new feature for the luxury Volvo wagon, and I hear is possibly a first in any car. Lovely audio systems provide beautiful clear and full sound for those musically minded. Bluetooth communications, climate air-conditioning and there are auxiliary outlets for those who want to run added electronic devices while journeying on-board the new Volvo V90 wagon. HD screens can be mounted in the back of the front headrests so that rear seat passengers can enjoy a movie. Volvo’s Pilot Assist technology is a feature that assists by monitoring lane markings and the edge of the road. With this system activated, you can take your hands off the wheel and the V90 will stay in its lane. By law the system will only run for 15 seconds before ensuring that you take over the wheel again. Adaptive cruise control with automatic braking, pedestrian detection, intersection scanning and other integrated safety systems are part of the superior safety levels inside the new Volvo V90 wagon. The Sensus Touch screen system found in the centre of the dash is one of the best of its kind. A simplified home screen and easy, intuitive ways of quickly finding audio, communication, and climate-control functions makes living with the V90 a breeze. Apple CarPlay and Spotify music streaming, offers plenty of easy-to-use entertainment. On the road, the new Volvo V90 Diesel feels comfortable, quiet, refined, and responsive. Two engines are currently available: the D3 and D4 which offer 110 kW and 140 kW respectively. Eight-speed automatics link the engine power and torque to the FWD and AWD options for smooth and effortless performance. Offering a very complete package from Volvo, the V90 Diesel wagons are an impressive means for carrying passengers and luggage long distances in refinement and comfort. And, for those of you who would like seven seats, a raised ride height and beefed up suspension for tackling light off-roading duties, the latest Volvo V90 CrossCountry is also here and worth a look. For any more information on the Volvo V90 Diesel models or, for that matter, any other new car, contact one of our friendly consultants on 1300 303 181. If you’d like some fleet discount pricing (yes even for private buyers! ), we can submit vehicle quote requests out to our national network of Volvo dealers and come back with pricing within 24 hours. Private Fleet – car buying made easy!